One thing my dear Momma never attempted to teach me was any love of sewing, knitting, embroidery, crochet and other needlework. Being a tomboy as a child, she was the one who deliberately damaged her work by pricking her finger and bleeding all over the delicate white fabric she was supposed to embroider. In short, she actively sabotaged all her teachers' attempts to teach the girls some of the fine arts. Need"les" to say, once school was over, she never as much as glanced at anything that involved textile fibers. To her great surprise, when I was about 16, I started to express an interest in sewing and even got an old beat up sewing machine. I liked knitting as well, so I bought a pair of knitting needles and attempted to teach myself some stitches, trying to remember the basics we had learned in primary school (which, trying to be true to my mother, I had always scoffed at). But with renewed zeal, by consulting friends and books I got as far as learning the garter, stockinette and rib stitch. Yes, I was knitting! Then I found out something quite shocking: I had not talent at all. Or, rather, my hands flatly refused to create the work of art my brain had in mind. I'd pick up the knitting needles, sighed when I saw the uneven knits, gaps and unintended loops. But, worst of all, frequently I found out that I had indeed picked up the needles, but my yarn (including the knitted bit) was still in the basket... so I gave up on the idea of knitting altogether. Almost twenty years later I never got any further than a squarish piece of... nothing. Fast forward to married life, which happened to take me to Canada. 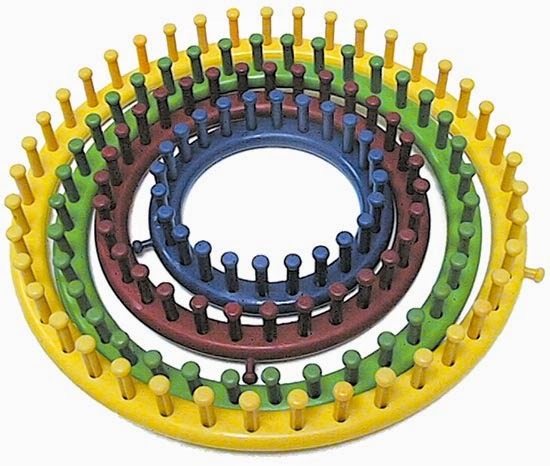 One day in a department store I saw quite an intriguing bag which contained a few brightly colored round objects with pegs stuck all over them. It said on the package: "Knitting without needles! Loom knitting is fun, easy, and faster than knitting with needles! 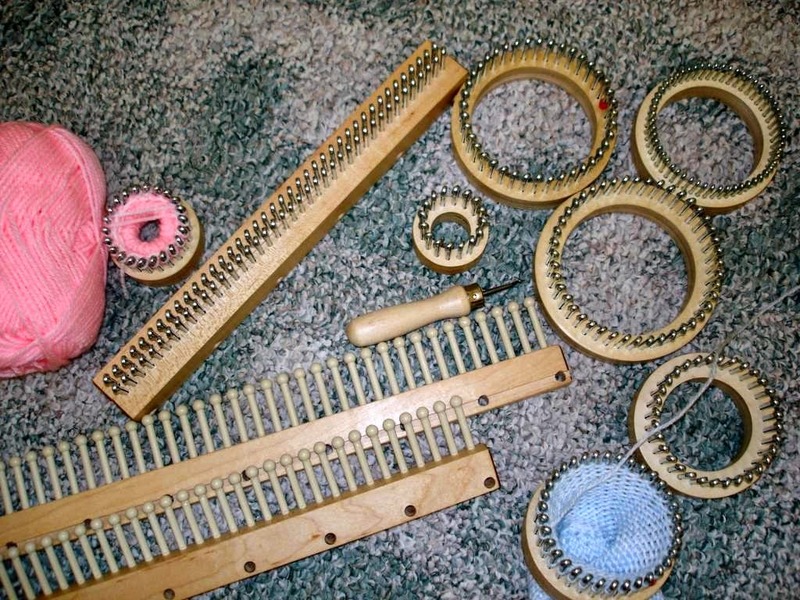 You can make scarfs, hats, sleeves, leggings, and many other things with a knitting loom!" and a few more catchy phrases that just about knocked me over. Whoa, that was for me! And so, $10 poorer and a set of looms richer, I set myself to learn this new art. After some research on the Internet, I found out the obligatory first creation is the "hat", which is what I did faithfully. WOW!!!! A whole new world opened! I can knit! I can knit evenly! I can knit in the round even! (a skill I never managed to master, on account of the first needle keeping to slide out of my work while I worked the third). And above all, I don't drop stitches or forget important stuff such as end up with the same amount of stitches that I started with! (to this day, I have no idea how I managed to start with 20 stitches and 10 rounds later, would end up with 27. Thus, all my squares looked like triangles). That was the exciting beginning of... nothing really. It's true, now I could create hats, but how many hats does one need? 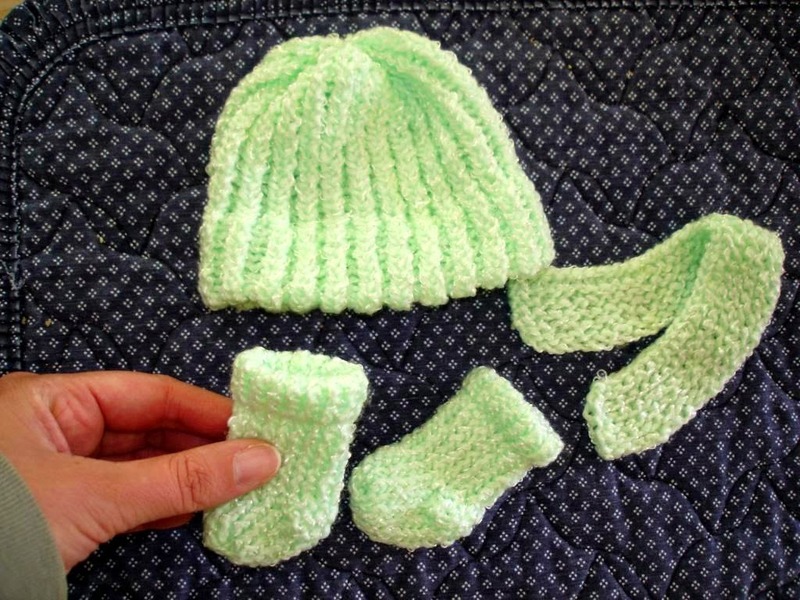 I knitted blue ones, grey ones, pink, white and multicolored, baby hats and oversized adult ones, but there is only so many people you can make happy with a knitted hat. 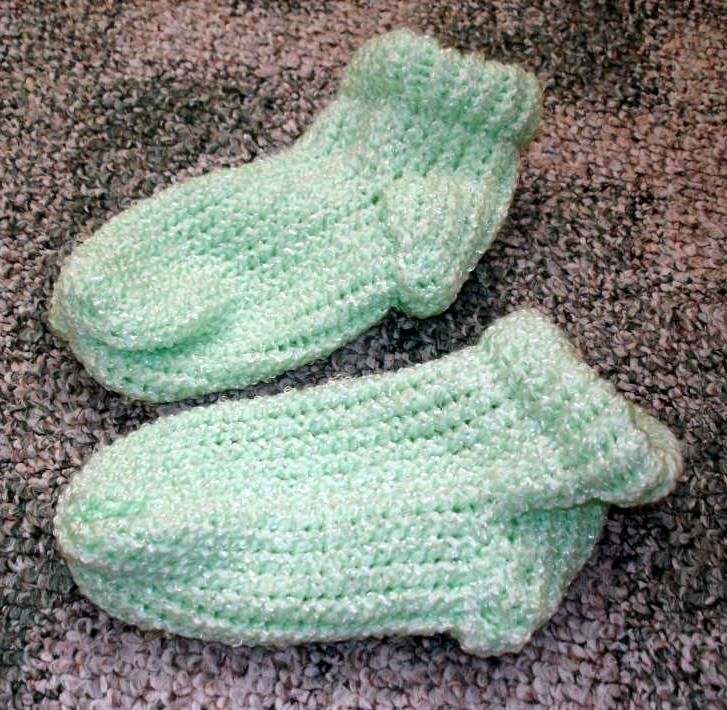 Although I added "bulky socks" to my repertoire (much to the delight of my Dad), for years that is where my skills excelled - and ended. But, the passion for loom knitting remained dormant. For years I searched all over the Internet for techniques and patterns, but usually I found the pictures and descriptions a bit unclear, and videos are sparse. So, today I took a bold step. In order to learn more about loom knitting, I decided to learn together with the rest of the (interested) world. By teaching others, I will learn, and be stimulated to continue. 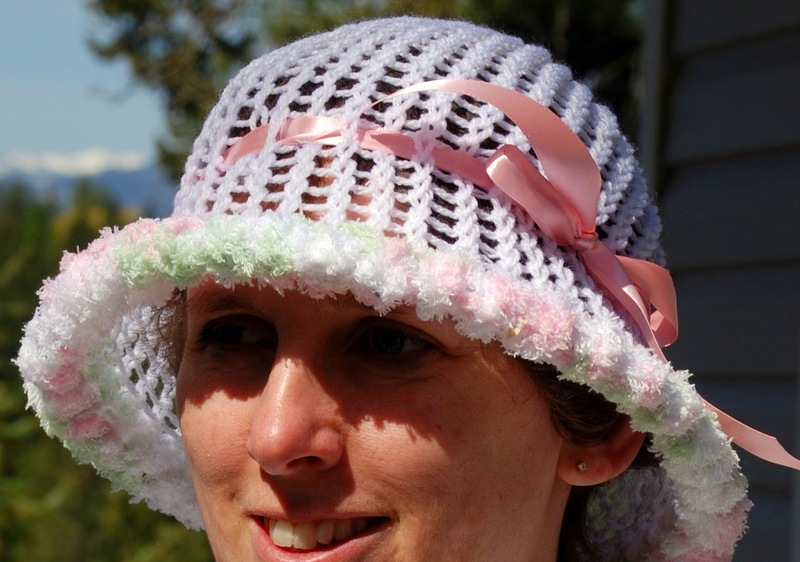 I can't promise that site will be added on forever, but within the next few weeks, I will teach you how to create a hat! Hope you'll have as much fun with it as myself, and please feel free to provide any critique, instructions, additions, complaints, compliments and other comments! (I am going to excuse myself and not follow the loomknitting blog, because I have no patience... :s) Good luck tough! I don't blame you one bit :D I have no patience either... that is really why this was a perfect hobby for me... most projects can be finished within one day :) Anything longer and I almost always give up, lol! I found my knitting stuff when I went through all my boxes. I have plenty of time to do some needles in the evening or in between things during the day. Hopefully it will change soon, if I will have a job! :-) Good luck with your loomknitting!